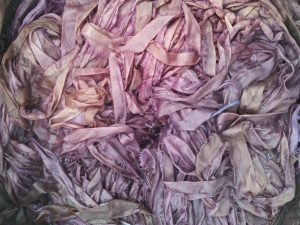 You probably already know that we hand-dye recycled sari and chiffon silk ribbons and sell them in 10metre packs. But we can also sell them in 100gram skeins for when you need a greater length at great value, for example for wedding bouquets and invitation trims, or general floristry use. We have the colourways stocked in our Etsy shop but can also hand-dye custom colourways to match your colours! 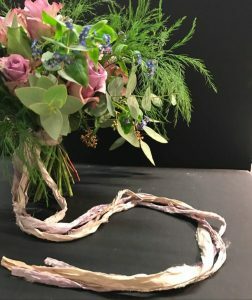 If you’d like to give your bouquets and floral art a unique hand-dyed twist, just contact us with your requirements.